Pollinators are a diverse group of animals that pollinate crops and wild plants. They are dominated by insects, such as bees, bumblebee, flies, wasps, butterflies, moths, beetles, weevils, thrips, ants, and midges. The most important pollinating insects are the bees. Vertebrates (bats, birds, monkeys, marsupials, rodents and reptiles) are important pollinators of certain flowers in subtropical and tropical environments, but they are generally regarded as playing only a minor role in European environments. Pollinators are fundamental to maintain both biodiversity and agricultural productivity, but habitat destruction, loss of flower resources, and increased use of pesticides are causing declines in their abundance and diversity [1-4]. There is an increasing public awareness that the decline of pollinating insects in both diversity and abundance is a serious problem. The public attention has been drawn mainly to the decline of the honeybee population. However a dramatic drop in the occurrence and diversity of all kinds of European wild insect pollinators, including wild bees, hoverflies, butterflies and moths is an even more serious problem (STEP-project; European Commission (EN): Red list). The European Commission took an active role in tackling the pollinator decline and adopted the first-ever EU initiative on pollinators. The Initiative sets strategic objectives and actions to be taken by the EU and its Member States to address the decline of pollinators in the EU and contribute to global conservation efforts. Among exposure to various chemicals, also the increasing use and release of nanomaterials may have a role in pollinating insect decline. Nanomaterials can be intentionally released into air, water bodies and soil (see basics – release of nanomaterials) in form of plant protection products (nanopesticides), fertilizers (nanofertilisers), as well as remediation agents. 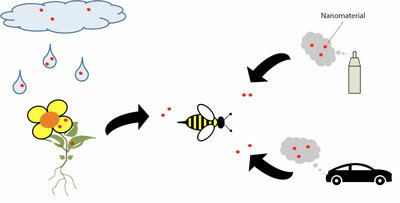 The main potential route of pollinating insect exposure is via foraging on nanomaterial-contaminated pollen. Nanomaterials access pollen directly via aerial and water droplet deposition and indirectly from nanomaterial plant uptake from contaminated soil through the root and leaf surface uptake. In addition, managed pollinating insects, such as honeybees, may be exposed in the hives due to direct application of products that contain nanomaterials. Namely, it has been suggested that silver nanoparticles could be efficient in the honeybee treatment for Nosema apis species infections [5, 6]. Currently there is no data on the realistic concentrations of nanomaterials in pollen available. Hence, it is impossible to estimate the amount of nanomaterials that pollinating insects are exposed to. One reason for the lack of such data are analytical constrains in the detection of nanomaterials in the environment. Nanomaterials in nanopesticides were found effective against target insects, such as mosquitoes and blowflies. Therefore, it is reasonable to assume that they would also affect non-target pollinating insects. In addition, some nanomaterials have an effect on managed pollinating insects, such as honeybee and bumblebee. Adult honeybees were not affected by high concentrations of titanium dioxide and carbon black nanoparticles applied via the food. In contrast the same levels of zinc nanoparticles and significantly lower levels of cerium dioxide or silver nanoparticles induced adverse effects. Regarding bumblebees and fruit flies, damages caused by nanomaterials have been reported. However, none of these studies was conducted under environmentally relevant exposures including realistic environmental concentrations and feeding mode (pollen, hive). Therefore, they are of limited significance [6-12]. It was identified that pollinating insects come into contact with nanomaterials. Laboratory studies imply that nanomaterials can induce adverse effects on pollinating insects. However, as data on environmentally relevant exposure concentrations are lacking, an estimation of risk is difficult. The advance of analytical techniques to detect nanomaterials in complex matrices, such as pollen or honey, will enable more precise estimation of exposure and risk. 1. Sánchez-Bayo, F et al. (2019), Biol Conserv, 232 8-27. 4. Ollerton, J et al. (2014), Science, 346(6215): 1360-1362. 5. Gogos, A et al. (2012), J Agric Food Chem, 60(39): 9781-9792. 6. Grzegorz, B et al. (2013), Med Weter, 69(12): 730-732. 7. Benelli, G et al. (2018), Environ Sci Poll Res, 25(11): 10184-10206. 8. Jemec, A et al. (2016), Acta Biol Slov, 59 45-55. 9. Milivojevi, T et al. (2015), Chemosphere, 120 547-554. 10. Kos, M et al. (2017), Environ Sci-Nano, 4(12): 2297-2310. 11. Mommaerts, V et al. (2012), Nanotoxicology, 6(5): 554-561. 12. Alaraby, M et al. (2016), J Toxicol Environ Health B, 19(2): 65-104.